" WE'RE NOT FOOD CRITICS, BUT WE KNOW WHAT WE LIKE, AND WE WANT YOU TO KNOW, TOO." Our personal favorites are in green lettering. We do not list hotel (house-run) restaurants.
. . . New 2 Us . . .
our two most recent "dishcoveries"
Lahaina: Sale Pepe Pizzeria e Cucina in the Old Lahaina Ctr, 878 Front St. 667-7667 We love Italian cuisine! We can eat it almost every day. So, this new-to-us restaurant was a pleasure to finally check out (they've been open for a few years now). Everything we tried was a delight, and the staff was "just right" too - fun to relate to, knowledgeable and attentive to our needs without being "in our face" every few minutes (a pet peeve of ours). We plan to go here as often as we can, and we would encourage you to do the same. Dinner only, from 5 to 10pm daily except Sunday. Visit salepepemaui.com to learn more. SOUTH MAUI ~ Kihei - Wailea - Makena - Ma'alaea . Lahaina: CJ's Deli & Diner aka "The Comfort Zone" 2580 Keka'a Drive in The Fairway Shops at Ka'anapali Resort. 667-0968 Open daily from 6:30 am 'til 7:30 pm for breakfast, lunch & dinner...especially noted for their gooey burgers. Visit cjsmaui.com to learn more . . .
Lahaina: Mala "An Ocean Tavern" 1307 Front St. (behind Safeway) 667-9394 - Reservations suggested for larger parties. A Chef Mark Ellman restaurant. "Very hip" best describes this popular eatery. A tapas & wine kind of place, we enjoyed their crunchy calamari, rich potato soup, homemade totilla chips & guacamole, a great Kobe beef cheeseburger with "pommes frites," and an absolutely "killer" flan for dessert! Recommended! Open for lunch & dinner, Mon/Fri, dinner only Sat/Sun. See this photo ~ and their web site. Lahaina: Penne Pasta Café Owner/chef Juan Gomez's cozy Italian eatery. 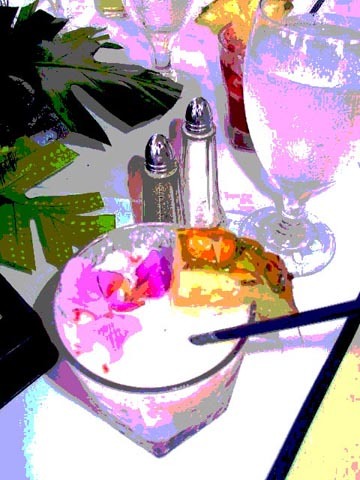 Quite affordable and "Maui-casual," our very favorite Maui Italian restaurant! 180 Dickenson St. - 661 6633 Open 'til 9:30 pm daily, 10 pm Fri/Sat. Check out their web site for menu items, etc. Lahaina: Surfside Pizza 505 Front Street (overlooking the street) 793-2650 Open daily 8:00am to 10:30pm. It's been quite awhile since a new Maui pizza place has been recommended on this page, but this pizza joint has what it takes to be here, and more! (Our only regret is that it's 40-minutes from home!) Here's a link to their website, for the menu and other things of interest. Go! Eat! Enjoy! Lahaina: Teddy's Bigger Burgers 335 Keawe Street, in the Lahaina Gateway center, 661-9111 Teddy's is a growing chain, with several locations on O'ahu, and another in Woodinville, Wa. Open for almost four years in Lahaina, we first ate there four times within a ten day span, it was that good; for burgers, that is. (We tried the crispy chicken sandwich and fish & chips, both very disappointing. But, their hamburgers are great, and that's what a burger joint is all about, yes?) Their fries are quite good, but not too outstanding, while the"potato flour" hamburger buns are always "fresh" and tasty. Teddy's yummy shakes are extra thick, and made with Maui's premium Roselani ice creams. Bottom line; if you want a decent burger at a fair price, Teddy's has 'em! Open 10am to 9pm daily. teddysbiggerburgers.com . ...mahalo for visiting this page! CENTRAL MAUI ~ Kahului - Wailuku - Waikapu - Airport..
Wailuku: 808 on Main 2051 Main St. (between Church & Market Streets) 242-1111 Opened in September, 2015, this spin-off of the popular 808 Deli, in Kihei ("Maui's Best Sandwich Shop") is another example of the new influx of quality eateries that are beginning to make Wailuku Town a "foodie paradise." A full menu is served from 10am 'til 7pm, Mon. through Friday. We're not sure what their reservations policy is, but I know they are very busy at lunchtime, so a wait might be in order if you go then. Their menu is diverse, with a nice selection of pupu, soups, salads, entrees and panini sandwiches, something to please just about everybody! This link to their Facebook page should prove useful. Wailuku: A Saigon Café 1792 Main St, 243-9560 The Island's very best Vietnamese cuisine. (One of the more popular "local style" restaurants on the island.) Recommended... Urban Spoon Review. Wailuku: Taco Style Maui has been open since March at 2070 Vineyard St. between Market and Church Sts. (way in the rear, through a passageway between buildings) 385.2946 In our estimation, Maui has been lacking decent and affordable Mexican-style food for quite awhile. Sure, there are some non-traditional nouvelle style "Mexican" restaurants here, but they're not all that good relative to the cost. Taco Style Maui is affordable, and very good, too! The downside, they're only open for lunch, 11am to 3pm M/F, closed Saturday and Sunday. Anyway, without further elaboration, trust us and go see for yourself. This link to their Facebook page should prove useful. Wailuku: UMI 1951 E Vineyard Street, between Market St. & Central Ave. 269-1802 It's a very rare thing when we fall in love with a restaurant at first bite. At UMI, we did exactly that. They are open seven days a week, from 5 to 9 - Monday, Tuesday and Wednesday, they're a Ramen Noodles house, Thursday through Sunday, their focus is on Sushi. (BYO, no reservations.) Talented chef Jayse Sato and his staff create "fusion dishes made up of sushi and hot food." Including the very best calimari we have ever had! Simply wonderful! Do yourself a favor, and head for Wailuku, we don't think you'll be disappointed. Their Facebook page tells more of the story. Pa'ia: The Flatbread Company 89 Hana Highway - 579-8989 Open daily from 11:30am 'til 10pm The Maui location is one of seven restaurants in a chain, the other six are all in (and all over) New England. There's a Hawaiian word, "pono," that translates as "righteous" or "to do right." This is one pono outfit, beyond any doubt, and without exaggeration! So, what exactly is a 'flatbread?' Essentially, a pizza by any other name, but their pizzas are far better than, and very different from, most others we've ever had! So, without belaboring this any longer, let me send you to their web site....it'll save me from writing a much longer overview! BTW, Pa'ia is a former sugar plantation town, now a center for "ocean sports" here on the Island. As such, it's a great people watching town! Well worth a visit whether you dine there or not! Hali'imaile: Hali'imaile General Store 900 Hali'imaile Rd, 572-2666 Noted for Chef Bev Gannon's "famous" crab pizza, and a nice variety of tasty Hawai'i regional treats to delight your palette. Located in a former pineapple plantation camp store, and well worth the drive to beautiful upcountry Maui! Visit their website for directions, open/close hours and such. In Lahaina Towne, on the ocean behind Long's Drugs. We're often asked where to find "Hawaiian" restaurants here in Maui. Wailuku: Sam Sato's in the Millyard industrial park, 1750 Wili Pa Loop, 244-7124 Breakfast and lunch only. Good local food, specializing in noodle dishes. Click here for our listings of Maui nightclubs with dinner options. "Please let them know we sent you!" are noted for both the quality of their food and service. to yourself to inform management of any dissatisfaction. USE YOUR BROWSER'S BACK BUTTON TO RETURN TO PREVIOUS PAGES. Please eMail us with any questions or suggestions for additional listings. has closed? Let us know that, too. Mahalo! Restaurants still in business that we've removed from this list include . . .